A comfortable holiday | carpe diem! Not merry, because that would require too much energy 🙂 Anyway I’m better at spinning, knitting and reading than merrymaking, and I’d back him at sitting and reading or watching TV against anyone else in the world. So I splurged and ordered a roast from my favourite butcher (in Ludlow, halfway across Britain. My environmentalist halo is sadly askew), bought several bottles of good wine during the usual shop on Friday morning, then pulled the bedcovers over the house and settled in for some self-indulgence. The international phone lines grew hot yesterday as we chatted with far-flung relatives before eating just a fraction too much Festive Food. We’ve established our own traditions over the decade in which we’ve had the Christmas break to ourselves, including a rather eclectic dinner consisting of most of our favourite things. Not many gifts because he’s already got his bike and I’ve already got my Schacht 🙂 <— That's a huge grin, by the way. I LOVE this wheel. I'm just glad it's my second wheel, because if I'd learned on it I can't imagine settling for anything less. As it is I am already familiar with the Louet Victoria, it's allowed to flex and creak because it's a travelling wheel. The Schacht is solid, smooth, almost noiseless, and it loves to spin. It lives upstairs only because there’s so little room in our front room. So on weekends I line up my favourite podcasts (usually about hiking in the UK and US), turn my computer chair from the monitor to the wheel and just… go. 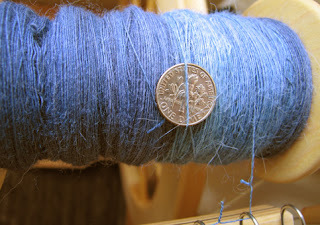 I’m currently spinning what I thought was merino/silk bought from Fyberspates at Alexandra Palace but I think the chap misidentified it, as there are intermittent lengths of alpaca. It’s spinning quite well regardless, and I may just try navajo plying it to preserve the colour variations, which are gorgeous. I’ve just tied my first drive band, too. I searched online for cones or long lengths of appropriate string until I found a blog mentioning that Alden Amos uses string bought from a grocery chain store. So I went for a little one-upmanship by plying some linen from the weaving stash into something of the right thickness, then abusing it a bit until it softened. I don’t know if this was a good idea, but it’s working! 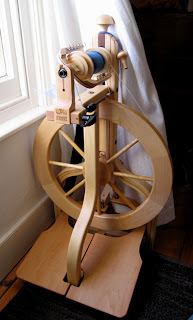 I’ve just re-read this and, realising that a year ago I didn’t have a spinning wheel, scarcely dared ply the peculiar stuff of my drop spindle… I’m impressed. By what I’ve achieved, but more because thanks to the Internet I know that these achievements have been duplicated or surpassed by many people. Because other people are able to pass on their knowledge and experience via the Internet. It’s an amazing world. Thanks, Joanne! Knitting has made my relative’s lives easier, not just because they get hand-knits, but because it’s easy to buy yarn. My sister has excellent taste. In return she and my brother-in-law received a pair of socks each. I sent my brother a sweater knit from an old Rowan pattern, plus a pair of Dashing in Cascade 220. Very fast knit, I just hope they fit. My mother traditionally receives a large box of exceedingly English chocolates, puddings, cakes and so forth. Alas, my sister actually asked for mittens, but too late for me to knit them in time for Christmas. With over a metre of snow in the last three weeks I think they’ll be needing mittens for some time yet! If they get mittens my brother should have mitten, too, so that’s three pairs. I’ve never knitted mittens, but Leena’s blog has delighted me for some time. And she sells mitten kits, traditional Finnish designs using wool she’s dyed with natural dyestuffs. They look wonderful online and even better in the hand. 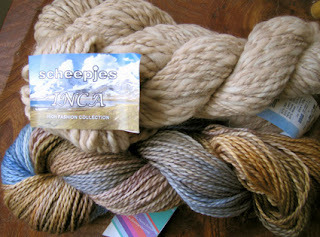 The wool is softish but sturdy and the colours are stunning. Here’s the first pair. I’ve been bold and altered the thumb pattern to stripes just because I love multi-colour stripes. This entry was posted in Uncategorized on December 26, 2007 by sarahw. Ahhh, the Schacht! We are now wheel siblings. 🙂 Mine’s a single treadle, but otherwise, the same. I’m so thrilled to hear about all your progress! Regarding the linen driveband..I’ve tried that and it works, but once it is stretched out, it doesn’t grab the wheel very well. I suggest cotton twine. I buy something called “chalk line” at hardware stores in the USA, it’s for surveyors’ use. I wax that briefly with an old candle to enhance its grab on the wheel, and whee, away we go. Truthfully though, anything will work that is tightly spun and isn’t too elastic. I bet the butcher can supply you with some similiar cotton?I love making mittens, and yours are stunning! Enjoy your boxing day, and keep posting those lovely fibery photos, please. Hugs and Happy 2008! merry xmas and happy new year! lovely mitts! I hope you had a Merry Christmas, and also have a happy new year! I am loving having quiet holidays after years of being dragged to too many relatives’ houses. Those mittens are just stunning! Merry Christmas, sounds like a good Christmas formula to me! We have just returned home from a lovely christmas with my family, I think that it will be another week before we batten down the hatches for a christmas meal with just us three (plus dog of course! )!I had similar problems with B in L socks -he too will have contrasting toes! The mitts are wonderful. Sarah, what lovely fibers! 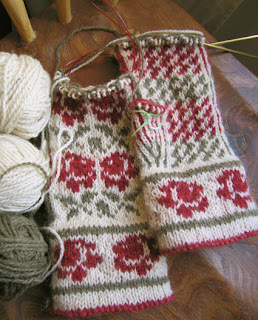 And the Finnish mittens are so very beautiful. May your new year be full of great things!